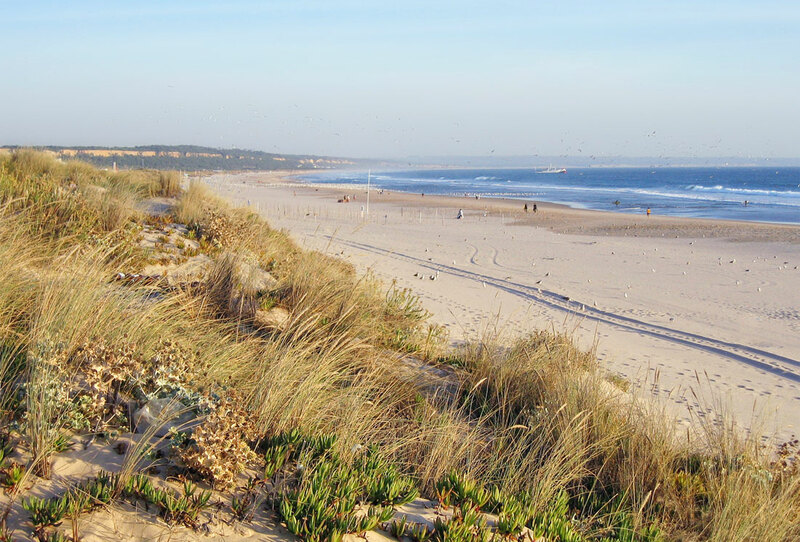 A stone’s throw away from the capital on the southern side of the Tejo River, the Costa da Caparica is basically a long stretch of sandy, clean beaches to suit all types of beachgoer. Stretching right down to the Cabo Espichel, its sandy expanses are lined with acacia and eucalyptus trees and sienna-coloured cliffs however it is the first five miles to the south of the town of Caparica which are the most well-known. The town of Caparica itself is a friendly yet simple affair with all the usual tourist trappings and facilities. Traditionally a fishing village, and women still peddle the fresh catch at the side of the street, it now serves mainly as the nearest summer resort for Lisboans escaping the city in the summer months and has a good variety of fish restaurants and bars. Colourful boats still reside on and work from the beach here, though nowadays it also sports a number of bars which play music into the night, and high on the cliffs behind lies a 16th century Capuchin monastery. Despite its proximity to the city, the beaches are relatively unpolluted and tend not to get as crowded as their counterparts near Cascais, especially as you move away from the town centre down the coast. In the summer, a small train makes numerous stops alongside the nearly 10km of beach divided up into smaller sections by the dunes, some sporting their own wooden beach bar. Bathing is popular down the whole stretch, and people regularly surf here, however it is the beaches nearest to Caparica which have lifeguards on duty in the summer. The further away from the town you venture, the more sparsely populated the beaches become and about half way along the 20 train stops gay bathers are common, and further still nudism is the norm. Just further south along the coast, the sheltered beaches and campsite of the Lagoa da Albufeira make it an excellent family destination. Windsurfing is also taught / practised here. Nearby, the Arriba Area is a protected zone of over a thousand hectares which contains a rich array of fossils and rocks, some as ancient as 15 million years old. Despite not being on the coast, many of the fossils are of marine life due to the Atlantic having reached further inland in the past. A few kilometres away, the new golf course of Aroeira provides quite a challenge with numerous lakes around the last nine holes. It is part of a larger leisure and holiday complex and is now the biggest golfing centre in the Lisbon area. Reaching Caparica from Lisbon by public transport is relatively easy. In the high season buses run directly from Campo Grande, and throughout the year a short ferry journey takes you from Praça do Comércio to Cacilhas, from where you catch a bus marked Caparica.